Bolt hosts a gun show for the stands on the sidelines of the first home football game of the season. 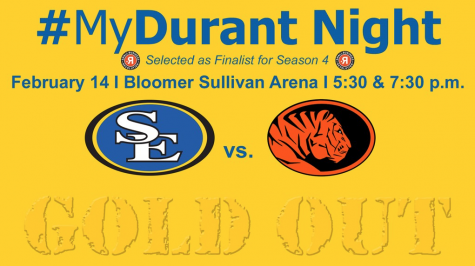 In 2006, due to prompting from the NCAA, Southeastern made the switch from the Savages, to the Savage Storm. Originally, there was conflict regarding this transition, in fact there’s still some seen today, but SE as a whole has shown great adaptivity in embracing this new identity. 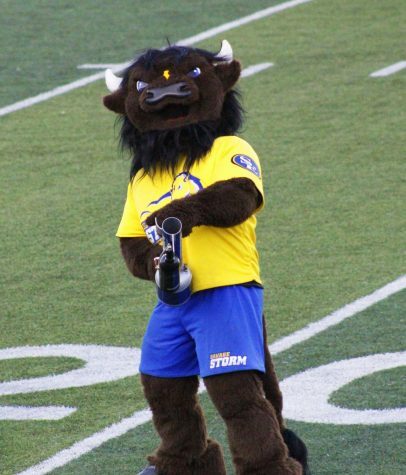 In 2012, SE began a two-year long project on finding a new mascot to go along with Savage Storm. A modified Mascot Task Force led by former president, Dr. Minks, was put in charge of creating the entity now known as Bolt. 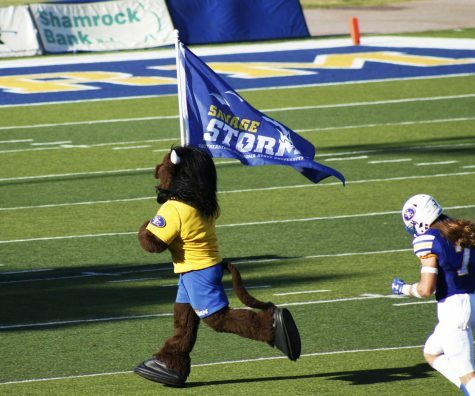 Bolt runs a Savage Storm flag across Paul Laird Field at football games to rally the crowd. 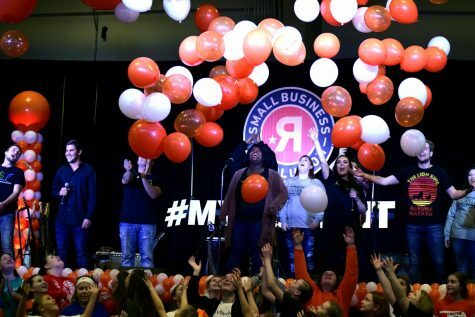 Fast forward to September 5, 2014, and the bison mascot was revealed at a rally in the Glen D. Johnson Student Union to students, faculty and staff. A second reveal was made for the public in Tailgate Alley, where a naming contest for this new mascot was initiated. 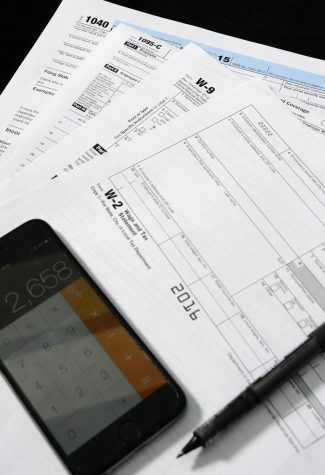 After two weeks of initial suggestions, the nearly 100 potential names were dwindled down to four favorites: Bolt, Lightning, Stormy, and Sulli. 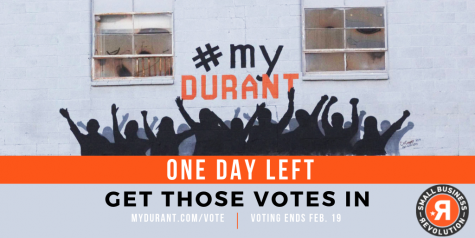 “Thousands of fans then flocked to the online polls and voted 4,636 times – nearly 500 votes per day – for their favorite of the four finalists,” states ww.se.edu/bolt/. 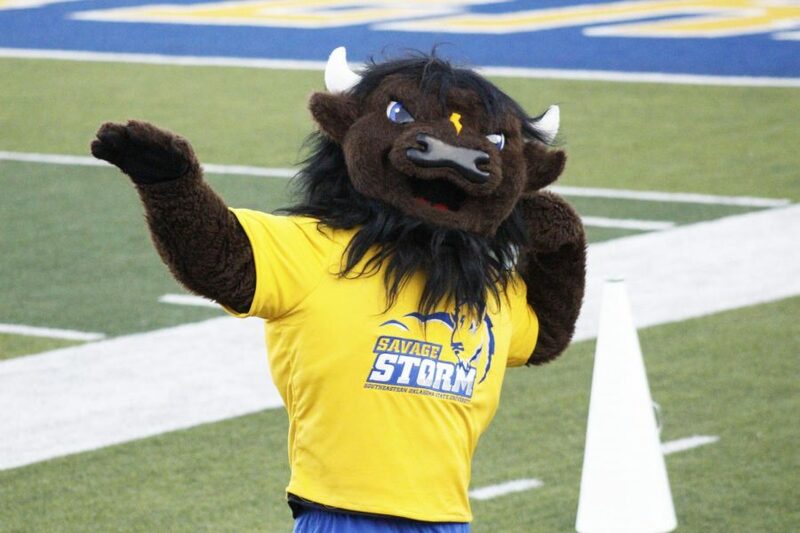 With 60.5% of the vote, BOLT was chosen as the new mascot of the Savage Storm. 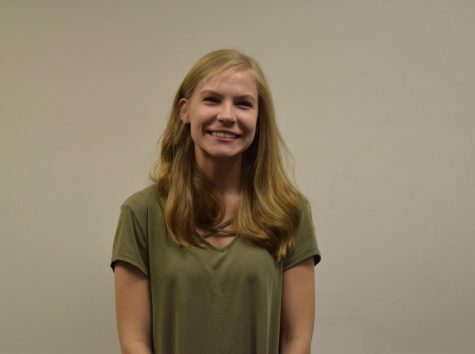 Bolt is now managed and overseen by Mitchell Emberson, the Director of Student Activities, under the Student Life Office. Firing the T-shirt canon is one of the many activities that comes along with the Bolt title. Before taking on the role of our school’s beloved mascot, team members are required to go through certain sets of unique exercises. Hand signals are key in the success and well-being of Bolt. The performance team members are taught many different signals in order to communicate with their handler. The handler is responsible for assisting Bolt during activities the suit makes more difficult. Signals used include when Bolt needs a drink, needs a break, needs to go to the restroom, when he has an emergency and many more. Since many of the events Bolt attends are outdoors and activity-orientated, one must imagine how heavy and hot the suit must be to wear. Therefore, the bison uniform is cleaned regularly in an attempt to keep it from obtaining a “bad or weird smell” said Emberson.